Don’t blink your eyes, that’s right! This isn’t a pug. 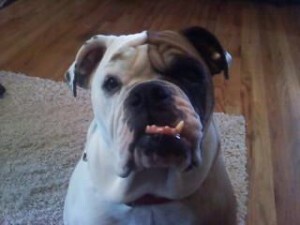 Bella is a 4 1/2 year old bigger mix of an American/English Bulldog and very cute! We took her in as a favor from an owner surrender, and hope to find her a forever home soon. She is potty trained, spayed, and very relaxed or content to lay around all day long. More information is soon to come! Bella’s adoption fee is $300. I am interested in making bella a part of our forever home, I just saw her on petfinder and will read more about your adoption procedures but we are interested in this cute lil lady.